Why Are Mortgage Payment Amounts Rising 3 Times Faster Than Home Prices? 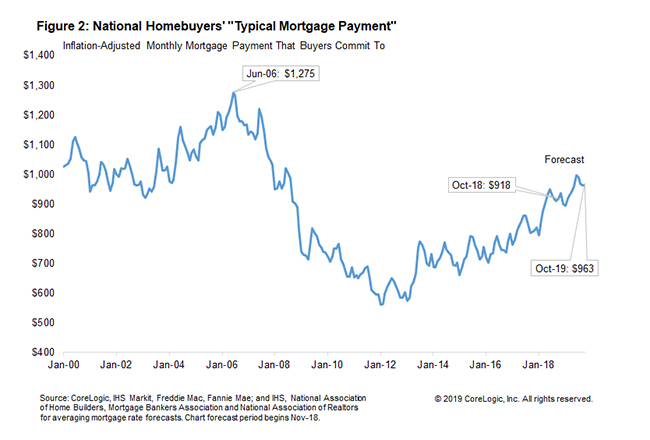 While the median price of a home sold nationally increased more than 5 percent over the 12 months ended in October, the monthly payment on that home went up by more than three times as much. That's the bad news. The good news is, that may be as bad as it gets. Andrew LePage writes in the CoreLogic Insights blog that the median price of a home sold in October 2018 was $218,733, a 5.2 percent annual increase. Over that same period mortgage interest rates rose by 0.9 percentage point. This magnified the home price appreciation and led to a 17 percent increase in the principal and interest payment on that home. However, LePage said that forecasts for both home prices and mortgage rates indicate a much slower increase in mortgage payments this year, probably closer to 7 percent. The CoreLogic Home Price Index forecasts that home prices should appreciate by 4.8 percent annually by October 2019 and there should be only an 0.2 percent uptick in mortgage rates. The latter number is based on the average of forecasts from Freddie Mac, Fannie Mae, Mortgage Bankers Association, National Association of Realtors, National Association of Home Builders and IHS Markit. LePage says that the typical mortgage payment, when adjusted for inflation puts homebuyers' current costs in the proper historical context. 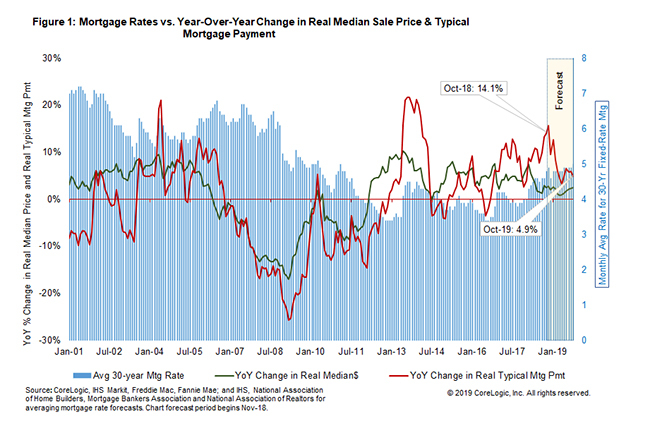 Figure 2 shows that while the real typical mortgage payment has trended higher in recent years, in October 2018 it remained 28.0 percent below the all-time peak of $1,275 in June 2006. That's because the average mortgage rate back in June 2006 was about 6.7 percent, compared with an average rate of about 4.8 percent in October 2018, and the real U.S. median sale price in June 2006 was $247,067 (or $197,200 in 2006 dollars), compared with an October 2018 median of $218,733. The October 2018 to October 2019 forecast above, reflecting home price growth of 4.8 percent is in real dollars. When real or inflation adjusted numbers are used, the median sales price will rise 2.5 percent. Using those numbers and the consensus rate forecast of 0.2 percent, the real typical monthly mortgage payment in October will be $963 in October 2019 compared to $918 last October, a 4.9 percent year-over-year increase, even more modest than the 7.2 percent nominal projection. LePage adds that HIS Market forecasts that real disposable income will rise by a little less than 3 percent over the next year. This means that, even with the slower increase in monthly housing costs, homebuyers will have to dedicate a larger share of their income to paying it.